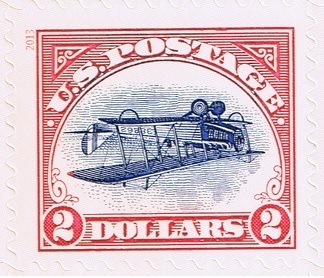 On May 14, 1918 to commemorate the start of the first regularly scheduled airmail service, the post Office issued a stamp featuring the Curtis JN-4H biplane known as the Jenny. One sheet of 100 stamps incorrectly printed with the biplane inverted was inadvertently released. These stamps became one of the most valuable collectables in U.S. history. The Post Office reissued the $2 stamps this month.